Provide comfort for the family of Donna Smith with a meaningful gesture of sympathy. Passed away peacefully at the Rosedale Retirement Centre on Tuesday, April 2, 2019. 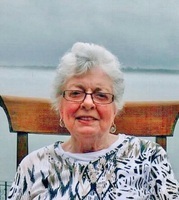 Donna Mae ( Glazier) Smith, at the age of 84 years. Beloved wife of the late Edward Smith and dear mother of Angie (the late Mark) Donaghue. Will be missed by her grandchildren, Erica (Trevor) Barney, Megan (Trevor) Donaghue-Todd, Rylee (Rob), and Kasey (Leah); great-grandchildren, Brandon, Logan, Freya, Ingrid, and a baby boy on the way; and by her daughter-in-law, Kim Elliott. She was predeceased by her son, Rodney Lee-Smith, as well as by her parents Violet (Orr) and German Glazier. A celebration of Donna's life will be held at Irvine Memorial Chapel at Roselawn, 2451 County Road 15, Maitland on Monday, April 29th from 1-3 pm. As expressions of sympathy, donations to Brockville and District Hospital Foundation Palliative Care or Making Play Possible (https://www.canadahelps.org/en/dn/5466) will be gratefully acknowledged. Send condolences or make a donation online at www.irvinememorial.com. Provide comfort for the family of Donna Mae Smith (Glazier) by sending flowers. So sorry that I could not be there for her Angie. I so enjoyed your mother. We had many laughs together.